The Paper Cutters: Little Red Wagon Challenge #323 - Thanks!! Little Red Wagon Challenge #323 - Thanks!! Hello everyone! Hope everyone is settling into the New Year, I know I am! I'm so glad Mandy chose the challenge theme this week to be Thank You's, or Thanks. After the holidays I needed to make a few Thank You cards and this is one of the ones I came up with for a sweet friend of mine and of course for the challenge too! hehehehe! I used a little image from Eat Cake Graphics. It's called Benjamin Bear Sitting. I have used this little guy in a card class before and I just love coloring him! I used my Prisma pencils and blended with Gamsol. I also used one of the new My Favorite Things Stitched Scallop Squares dies. The plaid paper is also from My Favorite Things. This is so cute! I love that bear and the big button too! Oh, he is so very cute. I think I might love him. Awesome card. 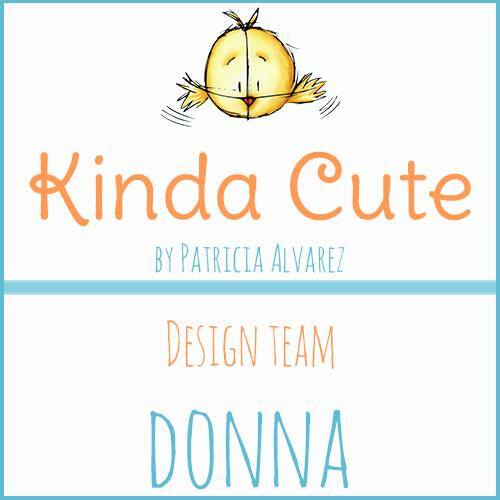 Donna, little bear is so darling! Love your card! So cute. What a great way to say thanks.